After much request we have finally produced our version of the Ride on Mesh Bug Rug as part of our BeatBugz Range. Developed to be close contact to not effect your rider aids whilst in the saddle which is particularly important when hacking out and directing your horse laterally away from traffic. 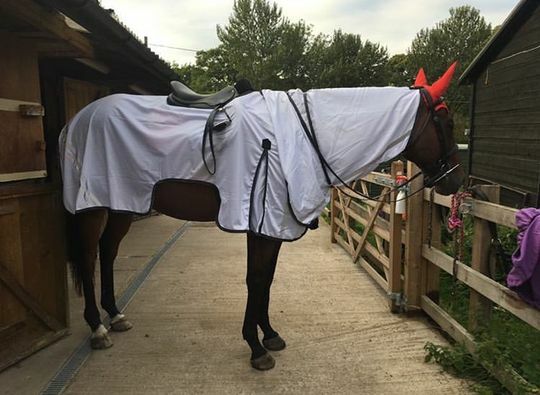 This product has been designed with super light weight fine mesh fabric, ideal horse excited or hot horses to help them keep cool and protected when hacking during the fly & summer months. The rug is durable, extremely well made with a high grade finish yet weighs nothing due to the light texture. We have panelled the black binding edge with reflective sections; this runs along the full rug, tail, chest and neck and will enhance your visibility when being seen in front of traffic. We have also added reflective strips along the sides of the hind area to further increase visibility. The shoulder gussets have been duplicated from our Best Seller Turnout Rug to incorporate more freedom of movement which helps not restrict the horse when you are trotting and cantering along bridle ways helping to maintain suppleness within the fabric. The Tail Flap section is teamed with a removable fillet string for a secure fit. At the top of the neck you will find a poll loop which can be used to keep the neck in place, you do not have to use this if you do not wish to. To the saddle section we have created a cut out which we feel creates a much better fit and means you can still continue to use your same routine in regards to particular pads and half pads you may use. The mesh is made to be durable yet lightweight and is finished in a cool white fabric shade to detract the sun and keep your horse or pony cool on a warm and midget filled day. There will naturally be some UVA protection in this fabric as it offers great coverage but we are unable to offer a specific scientific % of UVA block. Lastly we have teamed with our Rubber Horzehoods Logo on the hind in black to add to the design and style. This is a beautiful piece of equipment for your horses wardrobe and will help to keep your horse comfortable and smart during the warmer seasons. Sign up to newsletters via the website to be notified of live launch. I bought this rug for my exracer who I was struggling to ride over the summer because of his detest of flies, biting and non-biting. I can now ride him at anytime without the worry that he’ll throw a strop - he’s so much happier with this rug. The fit is perfect, very adjustable and very lightweight and breathable which was a very important factor to me as he gets very hot. Highly recommend and will be buying for my other horses.